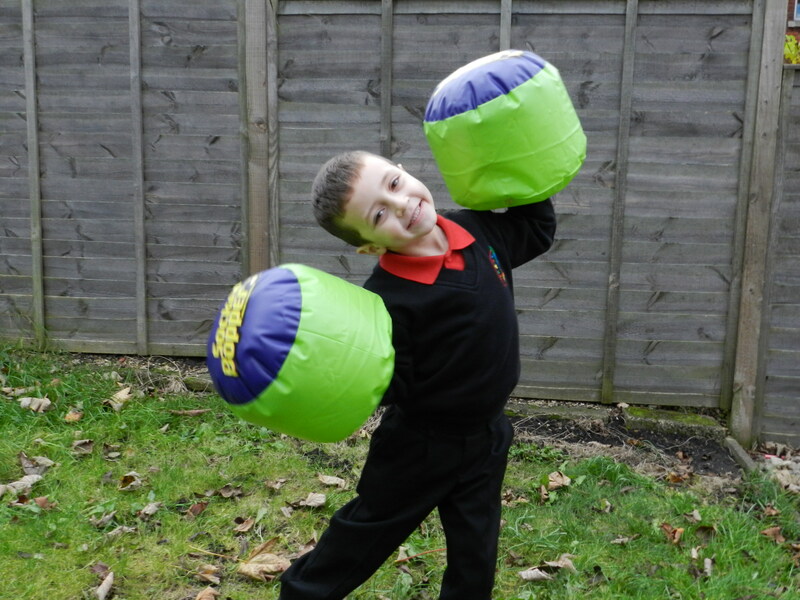 Wicked Socker Boppers are inflatable boxing pillows, the perfect gift for little and big kids. I loved the idea of Socker Boppers as soon as I saw them, they are great for burning off some energy without the risk of injury. Socker Boppers come in two colours, green and blue or red and blue. I think it’s always useful to have different colours, especially if you have more than one child as they can have their own colours and there won’t be a fight over who’s is who’s. Blowing up the Socker Boppers was easy and only took a couple of minutes in total. The valves are really easy to use which is great as I’ve found in the past with inflatable toys it’s almost impossible to squeeze the valve to get air inside. Maxx was really excited when he saw me blowing them up so I’m glad it only took a couple of minutes, it’s amazing how impatient little ones can be! Once the Socker Boppers are fully inflated it’s simply a case of slipping your hands inside and having some fun! As Maxx is only 4 we set out some rules before we started playing with them. No hitting people unless they want to play, no hitting people in the head/face and no throwing the Socker Boppers. Once the rules were out of the way we had a lot of fun! I was surprised by how comfortable they are to wear as I was a bit worried it would be uncomfortable and that it would hurt when using them. Thankfully when playing with Socker Boppers hands are cushioned and I didn’t experience any problems. My hands were snug when wearing the Socker Boppers and although Maxx’s hands are small he is able to wear them comfortably too and they stay on his hands really well, only occasionally flying off if he gets too enthusiastic which he finds hilarious! Maxx absolutely loves them and runs to them most days when he comes home from school to have a fight with his aunty Boo as he calls me. When I’m busy he’ll ask me over and over to play “Just for 5 minutes”, usually I give in as it’s only 5 minutes although it usually goes on for much longer. 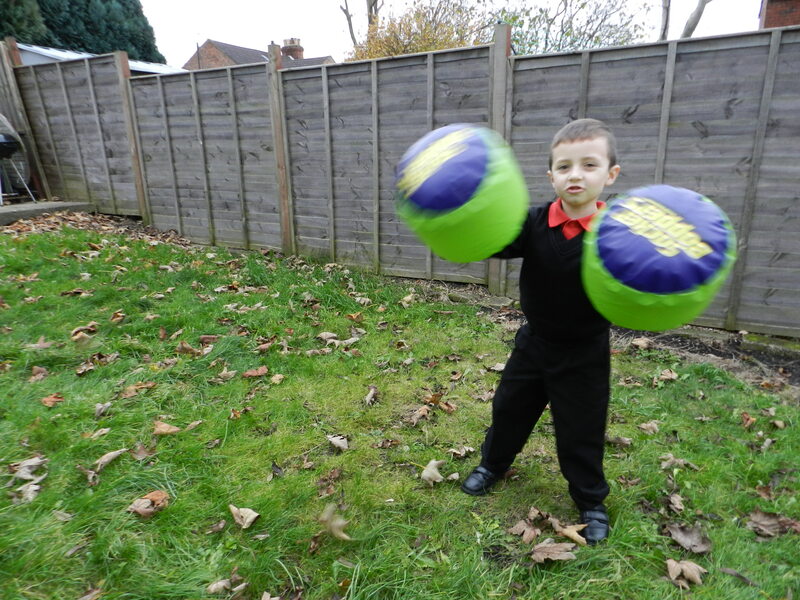 As I mentioned as well as being great for little kids Socker Boppers are great for big kids too. My brother came to visit and one of the first things he did was pick them up and start hitting me with them, brotherly love, some things never change! If you’re stuck for a present for your secret Santa Socker Boppers would be a great choice. Socker Boppers are made from super heavy duty gauge vinyl so are durable and won’t puncture or tear easily. Socker Boppers are priced at £9.99 which I think is good value for a toy that is proving popular day in and day out with Maxx.